Edison is a versatile addition to our American Walnut Collection, and our favorite piece in the showroom! Since we aren’t sure if it’s best described as a bench or cocktail table, we’ll let you decide. We do know it’s got just the right dimensions for both, and the distinctively angled legs – crafted from solid American walnut – provide all the style and support you’ll need for either purpose. 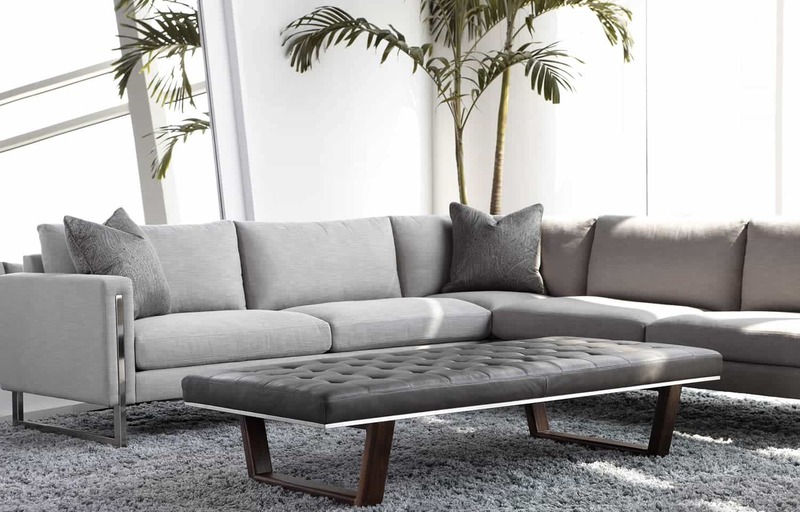 The generous dimensions of the upholstered top are accented by the clean tailoring of button-less tufting. Solid wood frame: Ash or Walnut. Brushed stainless steel trim on lower edge of the bench top. Each piece can be customized with any leather, fabric – including Ultrasuede® and Crypton®. Wood base available in domestically sourced solid American Walnut with a natural finish or solid Ash with a gray finish. The factory has partner with American Forests Council and plant trees for every piece ordered.